The setup guidance gives you step-by-step instructions on the pairing process and how to get the most out of your device. Jabra Talk 2 Bluetooth Headset. 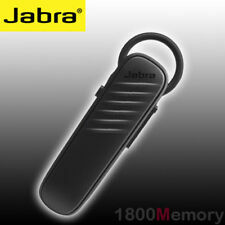 Jabra part number:Talk 2 backed byJabra 1 Year Warranty. With a sleek elegant design and a sound so real it’s like you were there yourself, you’ll never have to miss a conversation again. Wireless freedom through Bluetooth v4.1 technology with NFC / Auto Pairing. Trending at AU $105.59eBay determines this price through a machine-learned model of the product's sale prices within the last 90 days. Premium headset speaker coupled with HD voice for high definition sound quality Dual microphones provide excellent noise cancellation to block out background noise Smartphone voice control with Siri / Google Now button Button free headset interaction, just tap or double tap to initiate command features Up to 10 hours of talk time with the charging case (up to 3 hours on headset alone without charging case) and up to 7 days standby time. Jabra Stealth. Have an NFC-enabled phone?. Pair it with your Jabra Stealth by simply tapping the two together. Quick and effortless. The weight of the headset is perfectly balanced. It’s so discreet that you’ll hardly notice you’re wearing it. Premium wireless sound and inline buttons to control music or phone calls. Secure and comfortable fit with behind the ear wearing style and multiple sized ear gels Built toward US Military standards for rain, sweat, shock and dust resistance (IP54 rated). Rapid charge feature to provide an hour's worth of bather life in only 15 minutes of charging. Reflective cable for early morning or nighttime usage. Integrated training via Sport Life App to provide in-ear readouts during workouts: pace, time, distance, calories burned. Also works with most popular 3rd party sports applications..
JABRA STEP WIRELESS. Get all of your music. Trade up to wireless. Step's earbuds are so light and comfortable, you'll forget they're there. Soft, flexible GelHooks™ and a choice of three types of EarGels™ ensure they fit naturally and securely in your ear. But it talks to you too, guiding you through pairing with devices, who is calling or how soon it needs recharging. No more fumbling with the headset. Wireless Technology: Bluetooth. Supports Bluetooth™ for wireless connectivity. JABRA BOOSTBlack. Jabra Boost is easy to use. You never need to worry about running out of battery. The Jabra Boost is small and slim, it gives you all the power you need. No more running out of battery when you are on the go. Jabra Sport Pace. JABRA'S SPORT LIFE™ APP. Jabra Sport Pace allows you to perform a fitness test, indoors or outdoors. All you have to do is run as far as possible in 12 minutes. Ever dreamt of getting rid of those wires when training?. Wireless Technology : Bluetooth. Earpiece : Double. Colour : White. Wireless Technology. Moues, mouse pads. In-Ear Only. Fit Design. Fit Design : In-Ear Only. JABRA TALK 30. We know you’ll be keen to receive your order as quickly as possible. Ends 30/04. T&Cs apply. Product SPECIFICATION. All of our products are fully backed by Australian manufacturer warranty. HANDS FREE STYLE GOES A LONG WAY. With the right headset, there’s no need to sacrifice style when multitasking is a must and a call is coming in. The sophisticated design of Jabra Style stands out with its simplicity but never clashes with your personal style. HD sound with noise reduction Superior comfort in a small design Dedicated voice control button UC variant with USB dongle Brand Jabra Model Stealth Bluetooth Headset Colour Black Connector(s) Single Earpiece Single Earpiece Design Earbud (In Ear) Fit Design Ear-Hook Features Built-In Microphone, HD Voice Wireless Technology Bluetooth EAN 0 732130 877619 UPC 7 32130 87761 9 MPN Does not apply UPC 7 32130 87761 9 EAN 0 732130 877619 Package includes1 x Jabra Black Stealth Bluetooth Headset Headset (Original Box) . Earpiece Type: Monaural. Sound Mode: Mono. Features: Battery Saver. Product Family: Classic. Product Type: Earset. There are occasional chances that an order of the exact product may be placed minutes before yours. Jabra Jabra Sport Earphone Sport Bluetooth Bluetooth Wireless Earphone [Parallel Import Goods]. Â· Bluetooth Wireless-Enabled. Â· Advanced Multiuse?. 2 Units Of Bluetooth Maximum Up To Three Hours Of Simultaneous Connections. Description The new Jabra BT2046 is the perfect way to get the most out of your busy schedule and of your calls on the go. This intuitively designed Bluetooth® headset is made to be paired easily with your mobile phone and is practical to operate. With its new, improved look, the Jabra BT2046 gives you enhanced comfort by allowing you to choose whether to use it with or without an earhook. With its attractive and user-friendly design, the Jabra BT2046 makes wireless calling easy. Brand Jabra Model BT2046 Bluetooth MPN BT2046 UPC Does not apply Wireless Technology Bluetooth Connector(s) USB Earpiece Single Earpiece Design Earbud (In Ear) Fit Design Ear-hook Features Built-In Microphone Color Black Color Black Package includes1 x.
Jabra Stealth Comfortable Bluetooth mono headset with up to 6 hours of talk time. Easily connect with NFC-enabled smartphones by simply tapping the two devices together. Activate Siri or Google Now directly from the headset. Enjoy clear calls with high-definition sound. HD sound with noise reduction Superior comfort in a small design Dedicated voice control button Stay connected with the nano sized bluetooth dongle UPC 615822007429 Color Black Model Stealth Compatible Model Universal Fit Design Ear-Hook Features HD Voice Microphone Built-in Compatible Brand Universal Wireless Technology Bluetooth Type Headset Colour Black Connector(s) Micro USB Brand Jabra Earpiece Design Ear-Pad (On the Ear) Earpiece Single MPN 1009980000240 Ma. Crystal-clear sound Connect 2 devices at the same time Easy to use Brand Jabra Model Talk Bluetooth Headset Colour Black Connector(s) Single Earpiece Single Earpiece Design Earbud (In Ear) Fit Design Ear-Hook Features Built-In Microphone, HD Voice Wireless Technology Bluetooth EAN 0 615822 003254 UPC 6 15822 00325 4 MPN Does not apply UPC 6 15822 00325 4 EAN 0 615822 003254 Package includes1 x Jabra Black Talk Bluetooth Headset Headset (Original Box) . Blocks out wind noise HD sound with noise reduction All-day comfort Brand Jabra Model Storm Bluetooth Headset Colour Black Connector(s) Single Earpiece Single Earpiece Design Earbud (In Ear) Fit Design Ear-Hook Features Built-In Microphone, Noise Cancellation, HD Voice Wireless Technology Bluetooth EAN 0 615822 006507 UPC 6 15822 00650 7 MPN Does not apply UPC 6 15822 00650 7 EAN 0 615822 006507 Package includes1 x Jabra Black Storm Bluetooth Headset Headset (Original Box) . Dust, water and shock resistant Secure fit for any job Supreme call quality in any surroundings Brand Jabra Model Steel Bluetooth Headset Colour Black Connector(s) Single Earpiece Single Earpiece Design Earbud (In Ear) Fit Design Ear-Hook Features Built-In Microphone, Water-Resistant Wireless Technology Bluetooth EAN 0 615822 007733 UPC 6 15822 00773 3 MPN Does not apply UPC 6 15822 00773 3 EAN 0 615822 007733 Package includes1 x Jabra Black Steel Bluetooth Headset Headset (Original Box) . Pair it easily with any Bluetooth device. A single user-friendly button lets you turn the headset on/off, initiate pairing, and control your calls without having to touch your phone. Depending on your preference, you can easily remove or flip the EarHook™ to fit either ear.Connect to two separate devices at the same time. When one of them rings, the headset will automatically stream the right call when you answer. If a new call comes through on the other phone, you’ll get an alert and the option to pick it up..
Jabra Steel is an industrial strength headset made for trade workers. Jabra Steel. Content: Jabra Steel 1 / Eargels 3 sets / Earhook 2 sizes / Wind socks 2. Bluetooth version: 4.1. Bluetooth talk range: up to 30 m (98 feet).